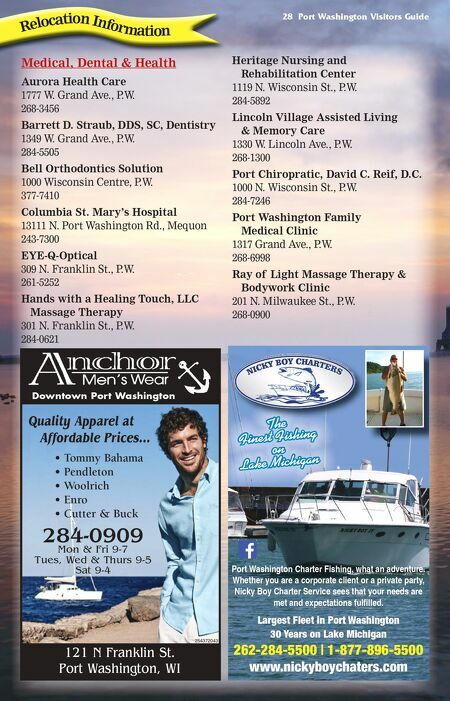 Port Washington Visitors Guide 29 R el oca t io n I n f or m a ti on Sauk Creek Dental 661E Green Bay Ave., Saukville 284-7111 Stone Gate Resources 404 N. Franklin St., P.W. 284-7777 Wellness in Touch Massage Therapy 116 E. Grand Ave., P.W. 483-8093 Senior Citizen's Center 403 W. Foster St., P.W. 284-5821 Transportation Johnson School Bus 3900 Hwy. KW, P.W. 284-5330 Ozaukee County Shared Ride 264-8294 or 238-8294 Associations, Non-Profit & Service Clubs Balance, Inc. 1350 14th Ave., Grafton 268-6811 Better Business Bureau 10101 W. Greenfield Ave., Milwaukee 414-847-6060 Cedarburg Chamber of Commerce N58 W6194 Columbia Rd., Cedarburg 377-5856 Grafton Chamber of Commerce 1624 Wisconsin Ave., Grafton 377-1650 Great Lakes Sport Fisherman 5146 Wickert Dr., West Bend 644-8481 Kiwanis of Greater Port Washington 511 N. Wisconsin St., P.W. 284-2590 Mequon-Thiensville Chamber of Commerce 6331 W. Mequon Rd., Mequon 512-9358 Ozaukee County Dairy Promotion Comm. 4576 Blueberry Rd., Fredonia 689-0401 Ozaukee Economic Development 121W. Main St., P.W. 238-7730 Ozaukee Masonic Lodge 504 W. Grand Ave., P.W. 238-9978 Paramount Music Association P.O. 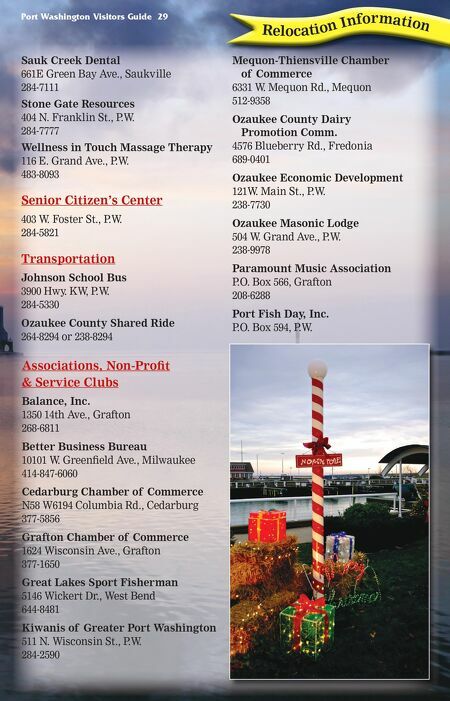 Box 566, Grafton 208-6288 Port Fish Day, Inc. P.O. Box 594, P.W.